The new structure of Mary Immaculate Church, dedicated on April 26, 2006, (during the 50th anniversary year of the Parish) belongs stylistically to the Romanesque Revival. The architects sought to design a structure that had a "parish feel"; a church that was inviting and comfortable, yet noble. The large worship space seats approximately 1000 people. On either side of the church's main entrance are statues of Peter and Paul (Peter is on the left as you face the front of the Church and Paul is on the right). St. Peter was the first disciple chosen by Jesus and designated by Christ... "I also say to you that you are Peter, and upon this Rock I will build My church; and the gates of Hell will not overpower it." (Mathew 16:18). Peter functioned as the pillar of the Church in Jerusalem as well as a leader of the missions to the Gentiles. Paul was initially a zealous persecutor of Christians. Following a profound conversion experience, he was baptized and became the most prominent of the early Christian missionaries. Peter and Paul are forever linked as the founders of the Church in Rome, the place of their martyrdom. The rose window is above the main doors of the church. The outer circle depicts the Holy Spirit forming the world at creation while the inner circle is the earth being formed. Note the different colors and symbols that depict the seasons of the year. The distance to the top of the bell tower is 58 feet. The bells chime the hours as well as the "call to mass". Through the main doors of the church is the Narthex, the foyer of the church. The narthex can be used as a gathering space or for the overflow at Masses filled to capacity. 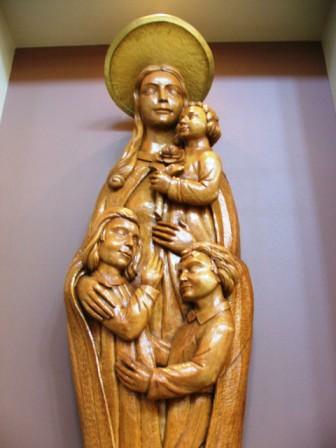 On the right side of the Narthex (as you come in the main doors) is a large statue of the Virgin Mary, carved by Ludwig Kieniger and donated by Michael J. Dupey of MJDesigns. The statue (which originally was placed on the outside of the old church building) shows Our Lady of Mercy with children gathered "under Mary's mantle". As you stand in the Narthex, or come in the side entrance down the Main hallway, the presence of the Blessed Sacrament in the Tabernacle can be seen. The Eucharistic Chapel of Divine Mercy serves as an appropriate place for quiet prayer and devotion in the presence of the Blessed Sacrament, as well as being a suitable space for daily mass. The chapel preserves a space for quiet prayer in the presence of the Eucharist even when the main body of the church is occupied with non-liturgical events such as rehearsals or public talks. The chapel IS NOT used as a cry room or for overflow during masses. The tabernacle, designed by artist Jim Cinquemani, is made of bronze and set in a red granite pillar. He also designed the custom sanctuary lamp which hangs above the tabernacle. The niche in the wall shared with the main sanctuary contains a statue of the Infant of Prague. The presence of this statue reminds us that our Lord, Jesus Christ, is "The Word made Flesh" (John 1:14). In the chapel are located two rooms for the Sacrament of Reconciliation. Reconciliation is offered after the 5:30 pm Mass on Wednesday and after the 8 am Mass on Saturday. On the back wall of the chapel is a replication of the only painting done under the direction of Sr. Faustina, the "Vilnius Image". Located immediately inside the main sanctuary from the narthex is the bi-level baptismal font, signifying a person's entry into the Church. The upper level of the font is used not only for baptisms, but also for blessing oneself upon entering the church. The lower level can be used for baptism by immersion, an ancient practice of the Church. In the niche on the left rear wall (behind the font) is the Ambry. 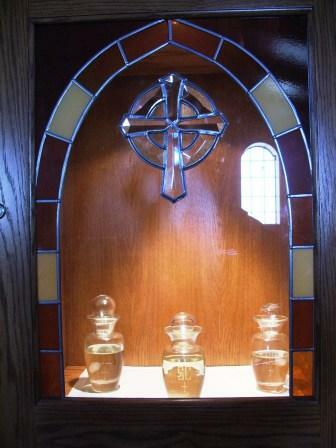 This niche contains the Holy Oils, which are used in various sacramental celebrations in the Church: Sacred Chrism, used in Baptism, Confirmation and Holy Orders; the Oil of Catechumenens; and the Oil of the Sick. On the right rear wall stands the statue of Our Lady of Guadalupe. 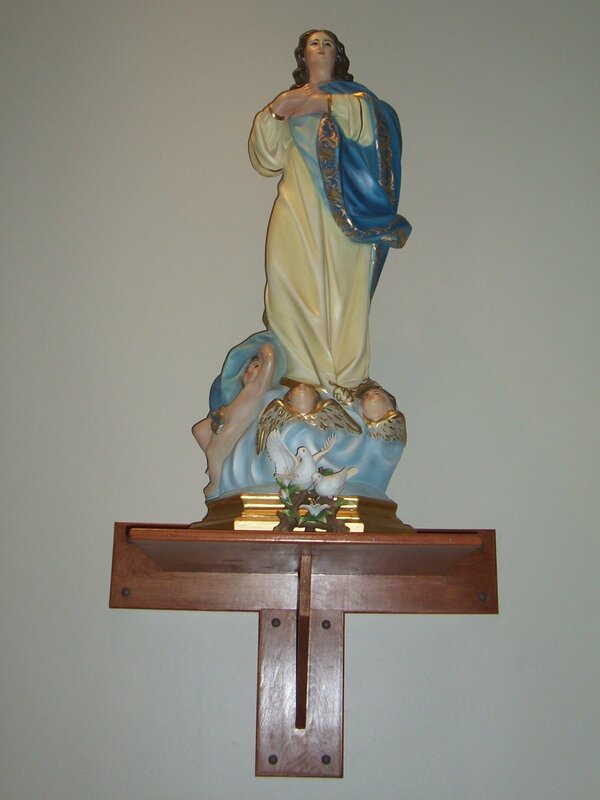 This statue was donated by the Familia Guadalupana of Mary Immaculate Parish. In 1531 the blessed Virgin Mary appeared to Saint Juan Diego on Tepeyac Hill outside of Mexico City. A figure of the Virgin Mary as an indigenous American Indian was imprinted on Juan Diego's cloak. This gave the native people assurance that Christianity was not only the faith of Europeans but the faith for them as well. The appearance of the Virgin Mary, taking place in early December, links our Lady of Guadalupe with the Feast of the Immaculate Conception on December 8th, the Patronal Feast of our Parish. Our Lady of Guadalupe is a focus of devotion at the parish, especially during the novena preceding her feast day on December 12th. Outside of the Eucharistic Chapel of Divine Mercy is the Juan Diego garden and the entrance to the Columbarium. The Altar, Ambo, Baptismal Font and Tabernacle are made of the same materials, symbolizing Christ's presence in the Word of God, the Sacraments, especially the Eucharist, and in the people of God. Beneath the main altar rests the reliquary containing relics of Saint Andrew the Apostle; St. William, abbot and confessor; St. Claire of Assisi; St. Pius X, Pope; and St. Francis Xavier Cabrini. St. Andrew was one of Jesus' first disciples and one of the twelve apostles. St. William, of 12th century France, was noted for his devotion to the Blessed Sacrament, proved to be a model bishop, and was in great demand as a confessor. St. Claire was a close friend of St. Francis of Assisi and the foundress of the Poor Clares. At the age of eighteen she was so moved by the sermons of St. Francis that she renounced all her possessions and eventually founded the order marked by its extreme poverty. St. Pius X was pope from 1903 - 1914. Two of the Pope's notable accomplishments were the inauguration of the liturgical renewal and the creation of a new Code of Canon Law. St. Francis Xavier Cabrini is the first U.S. citizen canonized by the Catholic Church and is patron saint of immigrants. Without assistance from the diocese, she founded schools, hospitals and orphanages in cities throughout the nation. The Large Crucifix that hangs behind the main altar is based on the Missionary Oblates cross, linking the parish with the Oblates who helped found Mary Immaculate in 1956. As you face the altar, to the left of the main altar, the large stain glass window depicts the Nativity of the Lord. The Stained Glass window to the right depicts the Resurrection. The progression of images from window to crucifix to window is a movement from birth to death and finally, to the new life of the Resurrection. As you stand in the Narthex and look to the right, down the first two doors on the left are sacristies. The first door on the left is a separate Vesting Sacristy for the celebrant(s). The Second door on the left is the Ministers' Sacristy which is for the preparation of the lectors, ushers, altar servers and the extraordinary ministers of communion. The last door on the left as you go down the main hallway from the Narthex opens into the Church Offices. 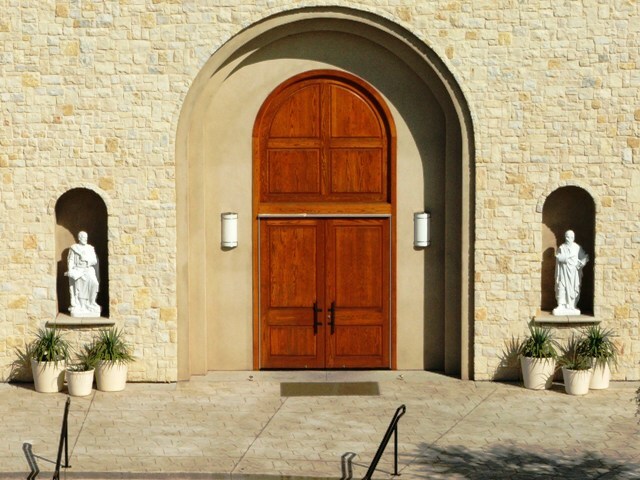 The first door on the right from the Narthex as you go down the main hallway is the Bride's Room/Education Room. This room is used for brides getting married at Mary Immaculate and includes access to the bathroom next door. It is also used for the Children's Liturgy of the Word on Saturday and Sunday at some of the Masses. The Second door on the right is the Family Bathroom or Private Bathroom for a Bride. The fourth door on the right is the Church Meeting Room. It is used for parish meetings, adult bible studies and other adult gatherings. The Stations of the Cross were carved by Ludwig Kieniger. They have been re-framed for the new worship space by artist Jim Cinquemani. The series of seven Stained Glass Windows on the western wall (to your left as you enter the main sanctuary) of the church depict the Corporal Works of Mercy. During prayer and meditation in the ambulatory, the windows above the stations are meant to connect practical charity with the Stations of the Cross. In the northwest corner of the Ambulatory is the Mary of the Immaculate Conception statue. The statue of the Sacred Heart of Jesus is in the northeast corner. Both of these statues were carried by hand from Mexico City by long time parishioners James O'Neil and wife Helen O'Neil. Donated by John Galli, St. Joseph the Worker is directly across from his spouse in the southwest corner of the ambulatory. St. Joseph, a carpenter by trade, was the husband of the Blessed Virgin Mary and the foster-father of Jesus. In the southeast corner of the ambulatory is a statue of St. Jude donated by John & Cynthia Center. 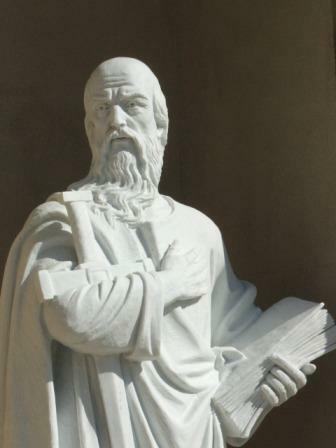 St Jude, also called Thaddeus, was an original apostle of Jesus and is the patron saint of the impossible.